I met Grace Wilson Birch (then just “Wilson”) when we were both in our first full year as working adults. 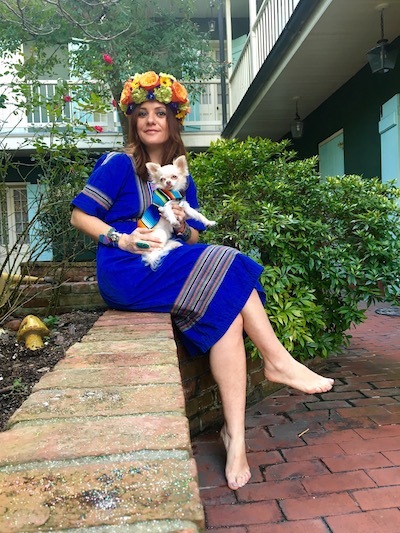 Since then I’ve watched as she has succeeded at everything she touches, including becoming an Instagram sensation (@GraceLovesNola), as has her adorable chihuahua, Presley (@PresleyLovesTheWorld). Recently, she has been filling her semi-retirement glittering Muses shoes, eating P&J oysters and drinking Old New Orleans Rum. You can generally find her and Presley sailing with her Captain (who is also her husband, Christian) on Lake Pontchartrain, riding her bike through the French Quarter or shopping and antiquing in Bay St. Louis. She says that she promises to return to e-mails (and reality) very soon – but a large part of me hopes she doesn’t; spending time with Grace is like being the luckiest tourist in your own town … magical things happen around her and a simple lunch can easily turn into a day that you’ll be telling stories about for the rest of your life. A: Recently I had a moment sailing on Lake Pontchartrain. We were drinking Gingeroo, shucking a sack of P&J oysters and sucking them fresh out of the shells. There were no sounds except for laughter and sails fluttering in the wind and nothing else mattered. We were all completely unplugged from technology and living exactly in that moment. There are plenty of times I get really happy over a perfect Instagram shot, though. A: As silly as it sounds, my number one fear is getting stung by a bee or a wasp. My mom is deathly allergic and I’ve never been stung. So I’m fearful of the pain, of course, but also the unknowns of what could happen afterwards. I mean, we’ve all seen the movie My Girl, right? A: Michael Pollan. Not only is he an amazing journalist, but I really admire what he’s done in raising the public consciousness – and certainly my own – of what we eat and where our food comes from and how we can do better. His books are all worth reading and the new Netflix series based on his work Cooked is a must-watch. I love the sense of community that comes from buying and eating local goods from local makers and growers. Q: What is your greatest daily (or almost daily) extravagance? A: Green juice. My goodness, I have spent a small fortune on fresh juice. My husband, Christian, finally broke down and bought me a commercial juicer, probably after seeing a particularly painful credit card bill. I should open my own juice stand, but so many local people already do an amazing job: Green Fork, NOLA Juice, d’Juice, Raw Republic, even Organic Banana. They have all my money and I’m better for it. A: Well, I wouldn’t be a good wife if I didn’t say my husband, Christian Birch. Although, my three pound long-haired chihuahua, Presley, is giving him a run for his money. A: I would love to play a musical instrument. I gave both piano and guitar a go, but my instructors said I had to cut my fingernails. So that was a deal breaker. A: Whistling on Quintron and Miss Pussycat’s album Sucre du Sauvage, which they recorded at the New Orleans Museum of Art. Check me out on “Spirit Hair” when you get a chance. A: I’ve been splitting my time between New Orleans and Bay St. Louis, what else could anyone want? Ok, maybe a tiny place in San Sebastian, Spain. A: The best friends are the ones you can pick up with where you left off, even if years have gone by. A: That I’m deathly afraid of bees. A: I try to see the good in everyone. But those who can’t see the good in anything … I find it tough to be around folks like that. Q: What restaurant do you find yourself recommending to friends lately? I don’t leave the French Quarter much. Q: Describe your perfect New Orleans day? A: It starts with coffee at one of my local spots, Arrow or Mr. Gregory’s. We are walking the dog through the Quarter, meeting new neighbors. Bonus if we get an impromptu tour of a courtyard or a home – you never know what’s behind our city’s gates and doors. Lunch or cocktails al fresco, at a sidewalk cafe, in Exchange Alley, in lush courtyards, on a balcony – as long as we’re outside under blue skies. I always remind people to take in the soundtrack of New Orleans. Sure there’s the actual music from dozens of buskers along Royal Street, Jackson Square, the river and beyond. But don’t forget the clop of the horses, the rhythm of the paddleboats, the whir and chug of the streetcars. We leave the city to cruise over to the lake and hop on the sailboat with that sack of local goodies and toast during the sunset to another perfect New Orleans day. Q: What’s your favorite New Orleans story? A: My Uncle Steve and my father instilled my love for New Orleans. Even though my parents raised me in Central Louisiana, my Dad made sure we’d get down to his favorite city often. I’d be bellied up next to him at his favorite French Quarter bars. For every bourbon he drank I got another cherry coke. You know that sweet, sticky smell when you first walk into an old bar? I love that smell. That smells like my childhood. When I attended Loyola, I navigated New Orleans with the other freshmen. I had a few key friends who had moved down a year before and met some nice locals, but I knew I was missing out on something. On lots of things. I called in back up. Uncle Stevie came roaring up to the back door of my dorm in his Jeep. I had called him the day before and asked him to show me the real New Orleans. He left the Northshore as soon as he could, always eager to unlock the magic of his city for someone. I reached for my flip phone and offered to give Johnny a ring. “Naw. I know where he is,” said Stevie. “How do you know he’ll be there?” I asked. “He’ll be there,” my uncle said. Stevie parked on the sidewalk in front of Tujague’s Restaurant. It looked closed to me, but my uncle swung open the huge doors and waved me inside. That sticky smell filled my lungs and I saw the most beautiful expression on a man’s face as he looked over my shoulder and saw my uncle. It was then and there that I fell in love with New Orleans. We clicked. I got it. I understood that as much as things change, they mostly stay the same. That you can leave for five days, five months, five years and you just pick up where you leave off. I learned that in New Orleans you don’t need plans or appointments. Q: Favorite thing to eat at Jazz Fest? A: It’s so hard to choose a favorite food on the Fair Grounds. In the last couple of years I’ve tried some new great things: crawfish strudel and sweet potato turnover to name two. If I had to choose my favorite thing at Jazz Fest, it would be first dish I always make a beeline for; the gates open and I race over to the spinach and artichoke casserole. (That and the rose mint tea. Ah! Breakfast of champions!) It seems like such a simple dish, but I’ve tried to recreate it the past five Thanksgivings with no success; I'll just leave it to the experts.